When is the Graduation Date? The Series 300 green certificate cover is our lowest cost diploma cover. Typically used for elementary and middle school graduations, the pliable, leatherette cover can open in either a landscape fashion with the spine on the top or as a book with the spine on the side. The green certificate cover, or diploma cover, will comfortably hold the 8 1/2" x11" Series 300 diploma or certificate sheet. 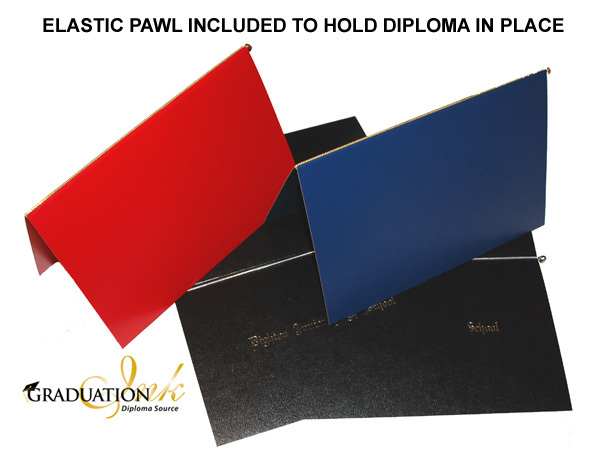 This diploma is held in place with a gold or silver elastic band called a pawl. Pawls are included with every order. The Series 300 green certificate cover is also available in four other colors. This green certificate cover can also include lettered foiling on the front or a custom foiled logo or mascot. Lettering can be a maximum of two lines and costs $1.25 per line on each diploma. To custom foil a logo or school mascot into the green certificate cover, please contact us for detailed pricing information. Graduation Ink can also design a diploma exactly to your specifications. Check out our diploma sheet and cover combinations. White envelopes can be included with your order. These envelopes will fit a folded Series 300 diploma. They are sold in packs of 12 for $4.20 each.